The discovery of planets continues to expand beyond the domain of professional astronomers. 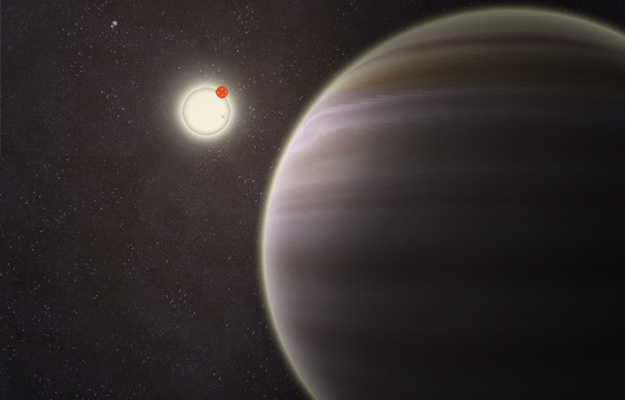 A joint effort of amateur astronomers and scientists has led to the first reported case of a planet orbiting a double-star that, in turn, is orbited by a second distant pair of stars. "I celebrate this discovery as a milestone for the Planet Hunters team: discovering their first exoplanet lurking in the Kepler data. I celebrate this discovery for the wow-factor of a planet in a four-star system," said Natalie Batalha, Kepler scientist at NASA Ames Research Center, Moffett Field, Calif. "Most importantly, I celebrate this discovery as the fruit of exemplary human cooperation-- cooperation between scientists and citizens who give of themselves for the love of stars, knowledge, and exploration." To read more about the discovery, visit Planethunters.org.